The traditional game plan for Amazon affiliates is to find a niche that is undeserved, rankable and has traffic. Sounds easy – not so much. You need to find a niche where you are not competing with huge companies for organic search but still has enough traffic available from SEO/search to generate sales. Because Amazon commission rates are in the single digits and products are typically in the $25- $150 range, you need a fair amount of sales volume. Affiliates really need 10,000 + viewers per month given the Amazon commission schedule. Well how about targeting some $250-$2,000 + products. It takes fewer unit sales to generate meaningful commissions if the products are higher ticket items. It takes less traffic. With so many products at Amazon, there are many high ticket items to promote. Sure Amazon has some very high-priced rare items and collectibles. When I wrote this article for instance there were a number of mens watches that were over $200,000! These are often one of a kind products. An interesting affiliate opportunity for some but they would not work for most niches.. Imagine the commission on some of these items. Watches are 7% so the commission would be in the $15,000 range. 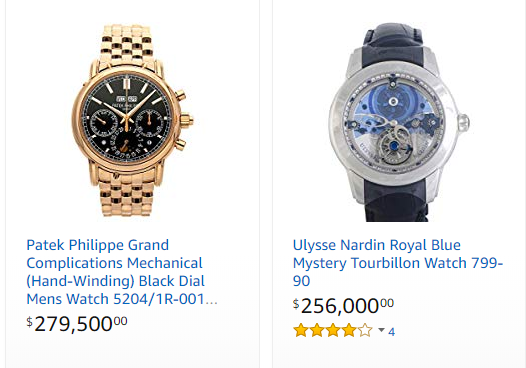 Unfortunately, few of these items actually sell at Amazon and the chances of you sending the customer to Amazon for a six-figure watch is more like a lottery event than marketing. But what about focusing on high ticket Amazon items that actually sell with some volume and have good reviews. Rather than focus on 1000’s of small ticket sales that requires high traffic volumes to your site, here are some ideas for big-ticket items. We avoid easy to source local products like televisions and highly personal products like jewelry which would have less chance of selling via Amazon. You can promote these products to your audience and email lists. I would promote them more like recurring high-commission products. Build a landing page for these high-end products and direct your email list readers to the page (never advertise Amazon products directly in an email. That is a TOS violation – see things that will get you banned) You might even consider a low-cost keyword advertising campaign. Or create a new niche site around a related group of these products. It only takes a few sales per month of these expensive products to make a difference in your income. Keep an eye on the Amazon Commission rates per category. With expensive products, it pays to be in the higher rates. Here are a few examples of high-ticket items you can find to represent on Amazon and why they make good products for an affiliate. Yes, you can buy an above ground pool from Amazon and have it delivered to your home. Like swimming pools, hot tubs are a high ticket item that will ship directly to your home. These generators are an ideal item. A consumer can not go down to their local store and buy one. There is a great variety of options in both size and fuel sources. I am an amateur guitar player and have purchased guitars in the $2k-4K range online. Guitars are often bought based on brand, size and reputation. The Amazon return policy makes this a safe purchase and my local guitar shop has limited options. Chandeliers are expensive. Not just the glitzy crystal types. Many are available in all decor types from Amazon. Photographers are always on the lookout for a special piece of glass. Very long telephoto lens, extra fast lenses, and other specialty lenses are just not available in your local camera or big box store. Unless you live near a huge city it is unlikely that you will have access to a store that sells telescopes. Everyone needs new clubs every few years. In the case of golf clubs, it is not access to places to purchase. Many golf courses have pro shops. It is the pricing that will matter with your local shop selling at full retail and bargains available at Amazon. Bicycles for serious riders come in many shapes and sizes depending on your sies, height, and type of riding you do. This variety is what makes Amazon appealing as a source. Horse people are nuts – in a good way. They are committed to their animals and riding. Tack shops typically have a small number of items to choose from and are not present in many communities. At Prosociate we also build websites for affiliates. Drop us a note if you want more information on how to build a site exclusively around a high-ticket niche.